Payments and giving should be meaningful, easy, and fast. We've built ChurchDesk to support that. 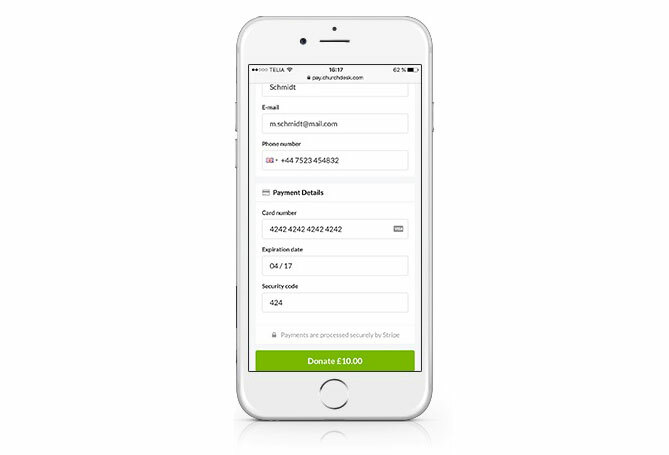 ChurchDesk offers a wholly integrated experience when it comes to payments, donations and tickets. You will never leave our interface and we take care of all the practicalities you would have elsewhere. With just a few clicks you can set up a payment or donation project. It works instantly and you can follow the progress in real-time. When users do payments and donations this information will be available from within People. This helps you do relevant communications and lists. 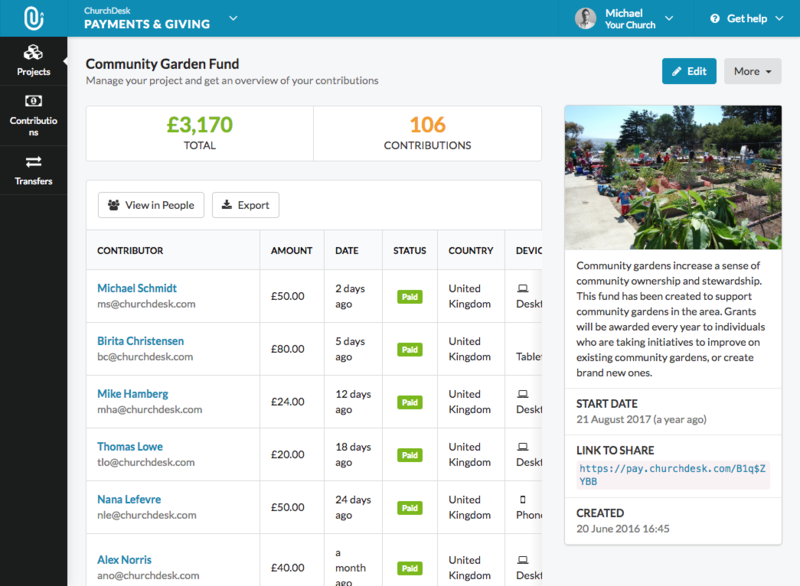 As part of the payment process, users can tick a box which adds a Gift Aid declaration for the project. With ChurchDesk you can receive payments instantly. We've taken care of all admin and setup. You just need to start your first project. Our ticketing system is built for the needs of churches and makes it really easy to handle signups and communications in one. We accept all major credit cards and in most common currencies. In some countries we also offer domestic payment methods. What do we mean by "no setup"? To receive payments you would usually need a payment gateway and other additional services. As a church you would need multiple contracts, data processing agreements and interfaces. With ChurchDesk this is not the case as we've built it into our application. You only have to deal with us. As you won't have to deal with other systems you also won't have different data sources with addresses, payment details, etc. In ChurchDesk you only have one set of data and everything can be reported and filtered to fit your need. People doing a payment automatically gets created or updated in your database. Based on this you can setup automated e-mails or include them in future newsletters. We even help you get the necessary consent to improve your communication.